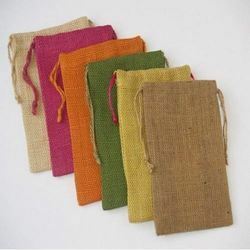 Prominent & Leading Manufacturer from Kolkata, we offer jute pouches. We are one of the leading manufacturers, exporters and suppliers of Jute Pouches. The offered jute pouches are commonly used for packing gifts, dry fruits and chocolates. Our supplied jute pouches are widely liked and appreciated by people of all age groups and ethnicities. The offered jute pouches are easily available at very economic and affordable market price.